Remember when you could bring liquids on an airplane? In your carry on? That will be my “those were the days” refrain to Aidan someday as I recount how I lugged a case of olive oil (and maybe a bottle of wine or two) home from Italy years ago in my carry on. That olive oil was like liquid gold, rich, buttery and with that deep, distinct aroma of fresh olives. It was too special to be cooked with, instead I used it sparingly, as a dip or dressing, or sometimes just to accompany a really lovely heirloom tomato. A really good tomato and a nice olive oil don’t really need much more than each other. Of course, you can’t always fly to Italy for your olive oil, and gone are the days of walking on a plane with a case, much less a bottle, of olive oil in your carry on now. However, you don’t really need to go to those extremes anymore, not when you can find a premium olive oil made right in Queen Creek. Arizona now boasts it’s own sublime extra virgin olive oil that has that same heady aroma of rich olives, with a slightly fruity taste and a little touch of pepper direct from Queen Creek Olive Mill. As an olive oil snob, I was so happy to find them. For the last few years now, I have been obsessed with Queen Creek’s Olive Mill’s olive oil, in fact, at the moment I have no less than four bottles of their olive oils on my kitchen counter. I could say that I like them because they are a small, family-run business (like us), or that they are a local farm (also like us), or that they were featured on an episode of “Dirty Jobs”, Aidan’s all-time favorite show ever. But, in truth, all of that is really just icing on the cake. 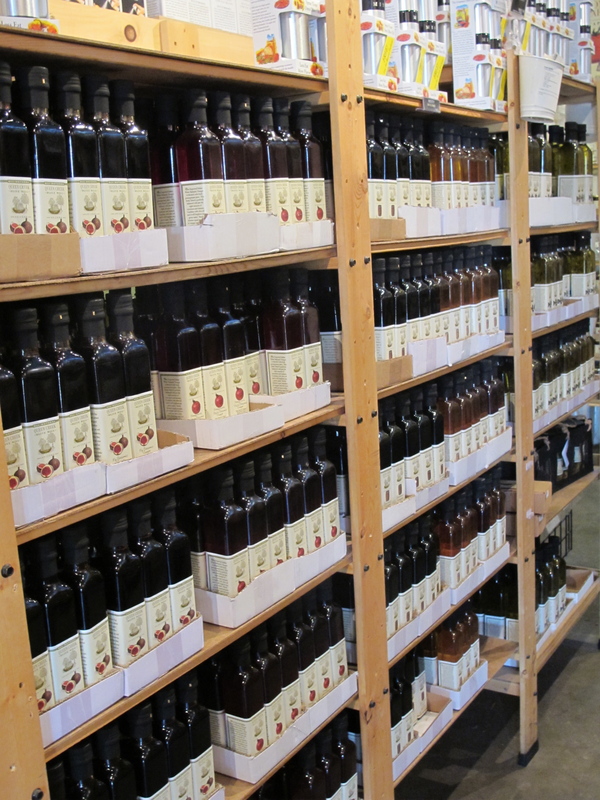 Queen Creek Olive Mill puts out an incredible line of olive oils that are masterfully blended and have full, rich flavors that work so nicely with all of the wonderful things we grow. I use their olive oils daily for cooking and baking, as well as serving with dishes as a dressing. Their Mexican Lime Olive Oil is my favorite to use on our salad greens. It is light enough to not weigh down the greens or coat them so much that their flavor is lost, but it adds a nice citrusy note that works well on its own or with a little balsamic vinegar. And truthfully, if I am going to serve our produce, I would much rather cook or pair them with a heart-healthy oil than anything with trans fats. Robert Holmes, the General Manager at Queen Creek Olive Mill, was nice enough to give me a private tour. He felt like a kindred spirit as we compared notes about our farms. We had much in common. Their operation is impressive. Perry Rea, the owner and master blender, started the olive mill in 2005 and it has since grown to include a charming marketplace with a restaurant, as well as on-site catering for events. During their season, Queen Creek Olive Mill presses 5 tons of olive a day. 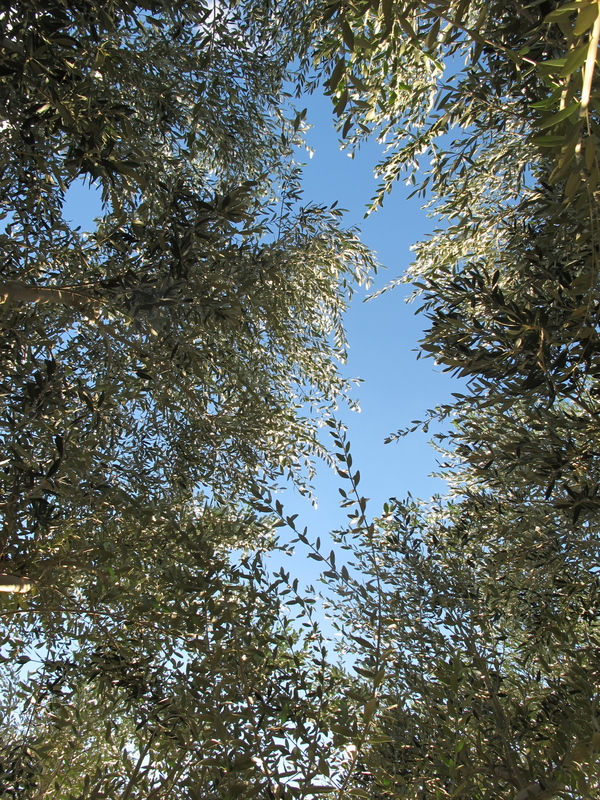 Olive trees produce one crop a year, starting with the trees waking up in late February and flowering in April. 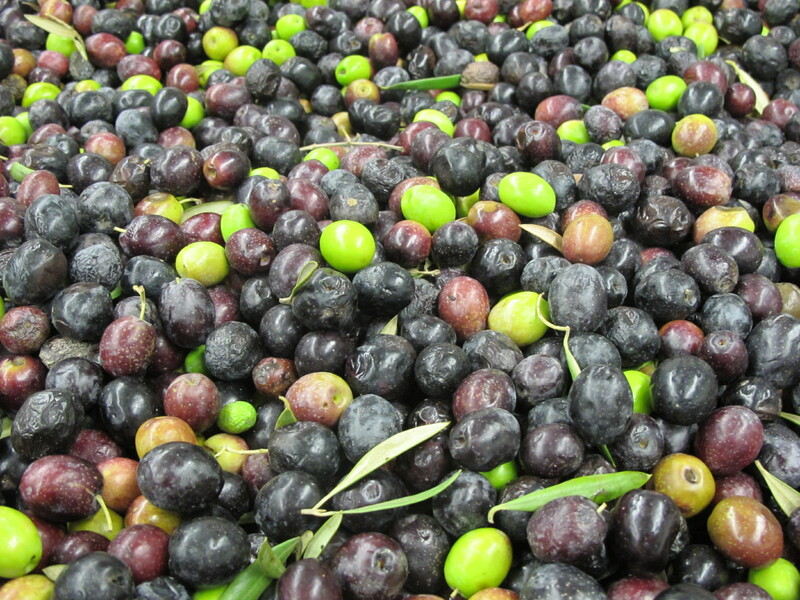 The olives form in May and are ripe and ready for pressing in October and November. 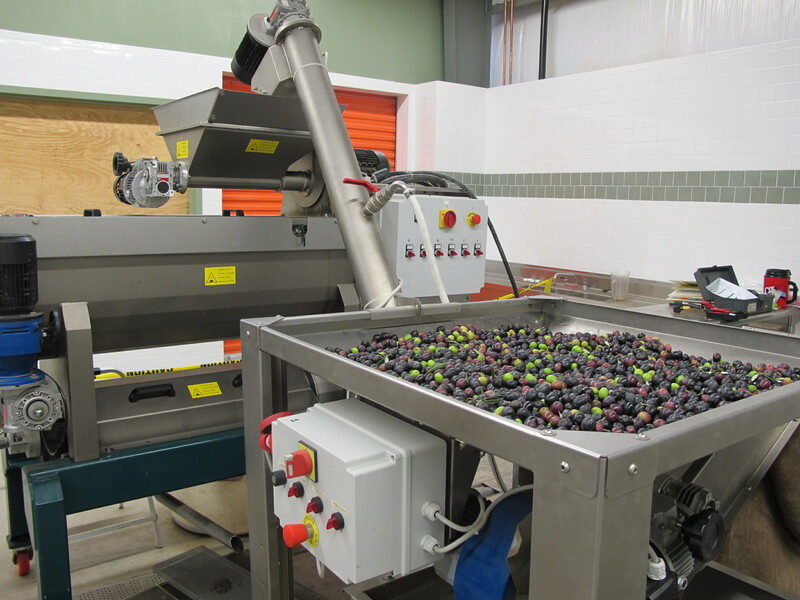 Queen Creek Olive Mill looks for a mix of 40% green olives (early harvest) and 60% dark purple olives (late harvest) for pressing. For any given olive variety there is only a 2-3 week window of opportunity to harvest, which makes deciding when to harvest critical. The ripeness and maturity of the olives are as influential as the variety of olive to the oil’s flavor. Robert walked me through their process and showed off their shiny new olive press. They are fanatical about the olives they use, pressing only those harvested by hand (never fallen olives) and cold pressing them within 24 hours of picking. Olive trees have no natural predators or pests in the Arizona climate, which allows them to tend their groves without using pesticides or mold inhibitors. This means that all they really need to clean off of the olives before pressing is dirt. They begin their process by first grinding the olives into a coarse paste, with the pits, seeds and flesh included. Using the entirety of the olive helps the flavor of the oil’s characteristics, with the majority of the oil coming from the flesh of the olive. The paste is then blended slowly in a large mixer and then at a high rate of speed in a centrifugal decanter allowing the oil to separate from the paste. This separates the oil from the flesh, pits, and most of the water. The olive oil is then decanted in an oxygen-free stainless steel storage decanter, where the oil and water are able to naturally separate. It is at this stage that Perry and his team begin to blend the oils. 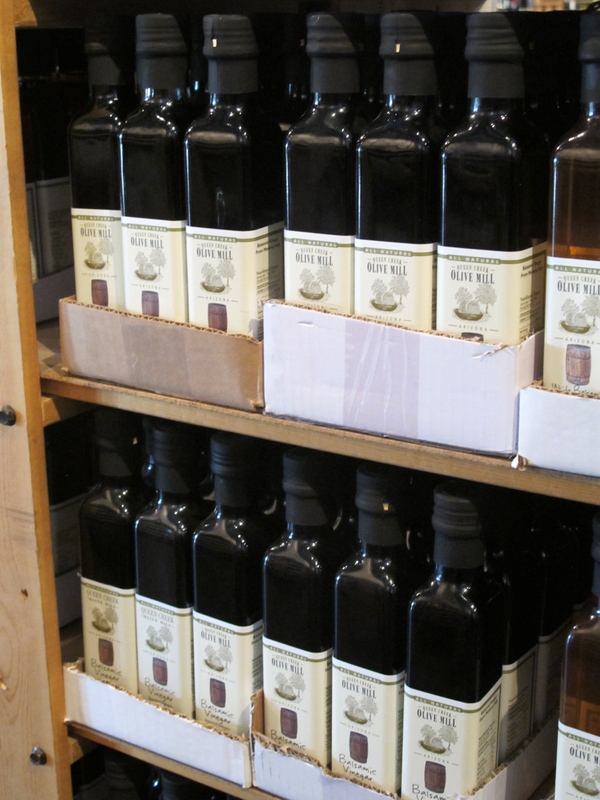 Queen Creek Olive Mill’s signature oil is the Tuscan Estate Extra Virgin, but they have a whole range of oils including infused olive oils with flavors such as Vanilla Bean, Blood Orange, Chili, Meyer Lemon, Garlic, Truffle, and my beloved Mexican Lime. All of the oils and products at Queen Creek Olive Mill are from Perry’s recipes, and he blends and tastes every one to insure their quality. To keep the oil at its freshest for their customers, they blend every 6 weeks and bottle every 3 weeks. Olive oil stays fresh longer when it has been stored in a cool (but not refrigerated) temperature, with zero light and oxygen. Unlike wine, olive oil doesn’t improve the age. So use it and enjoy! Robert also took me outside and showed me their olive trees. Olives only grown on second year wood, meaning that every time they prune it is two years before olives will bud on the new branches. This makes pruning a delicate and precise science. In order to expose as much of the tree as possible to sun, they prune the branches on the inside of tree, hollowing out the core of the leaves essentially, to allow sunlight in to more branches. New trees can take 3 to 5 years before they show olives, and it isn’t until their eighth year that they have a consistent production, but after that, with good pruning and care they can live and produce for a thousand years. Which also means, hopefully, that Queen Creek Olive Mill will be around for quite a long time with their wonderful olive oils. I loved my afternoon out there exploring. Sean and I had made the trip before to enjoy lunch under the olive trees, but it was fun to go this time and learn about their process from Robert. It is a perfect destination venue for a nice afternoon out or for a special event. They are even doing weddings now on the grounds. 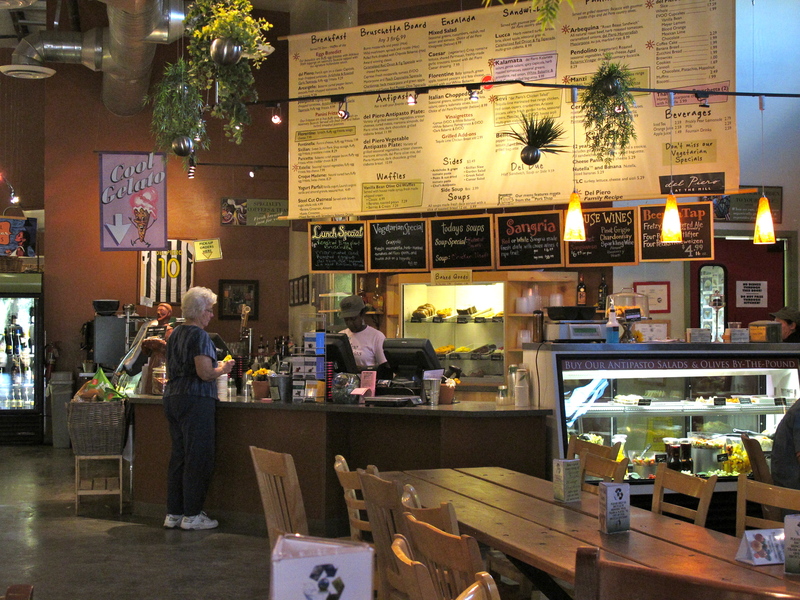 The marketplace is filled with not only all of their olive oils, but an array of products to compliment them, including balsamic vinegars, tapenades, spreads, herbs, and of course, olive. 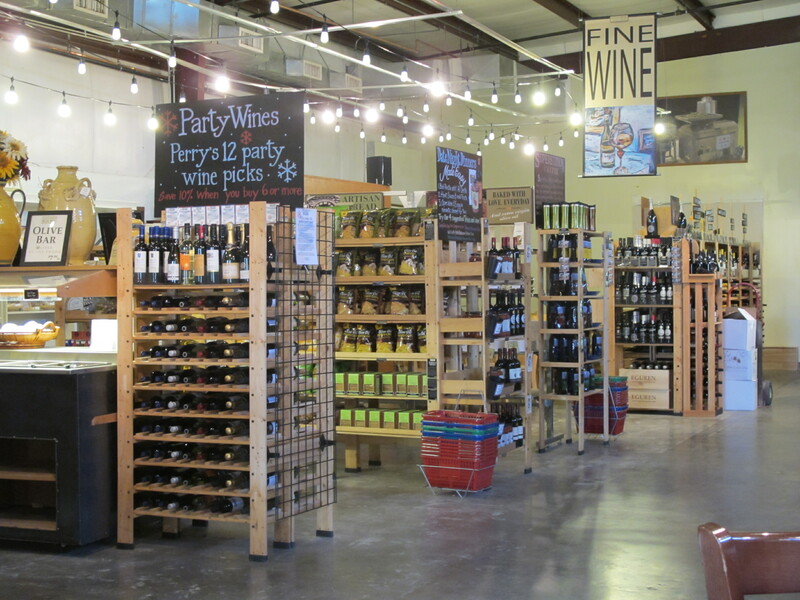 As well, they have a line of bath and beauty products, gourmet foods and a nice selection of wines. You too can take a tour of Queen Creek Olive Mill. 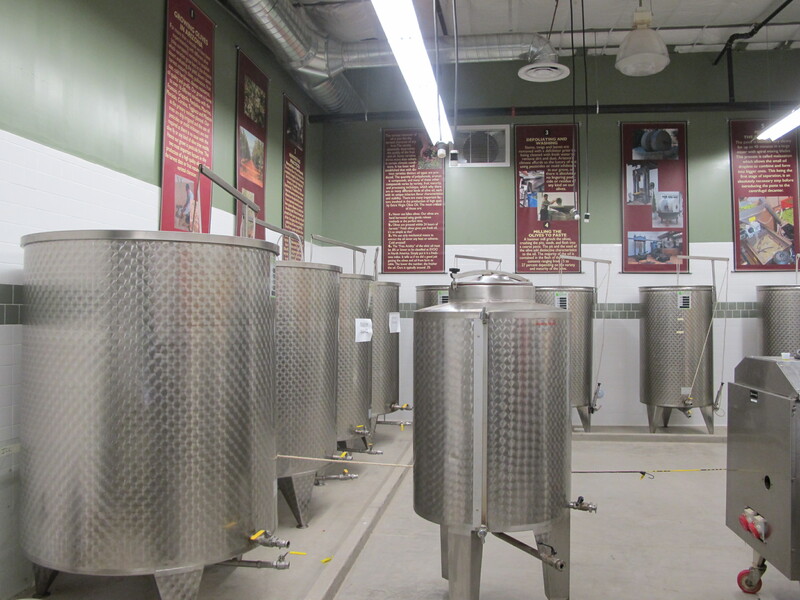 They offer a 30 minute tour of the mill and explain the process of how they press the olives. It is much closer than a trip to Italy and well worth the drive. Trust me, if I can make the drive from Peoria, you can too. *Their products are available for sale on their website. As well, they have a wonderful butter-to-olive oil conversion chart on the site to help when baking with olive oil, along with a whole host of recipes.